I have been seeing more butterflies in the garden during the past couple of weeks: black swallowtail, tiger swallowtail, monarch. I saw this monarch this morning. I was able to get a good view of the wings and verify that it was a female. 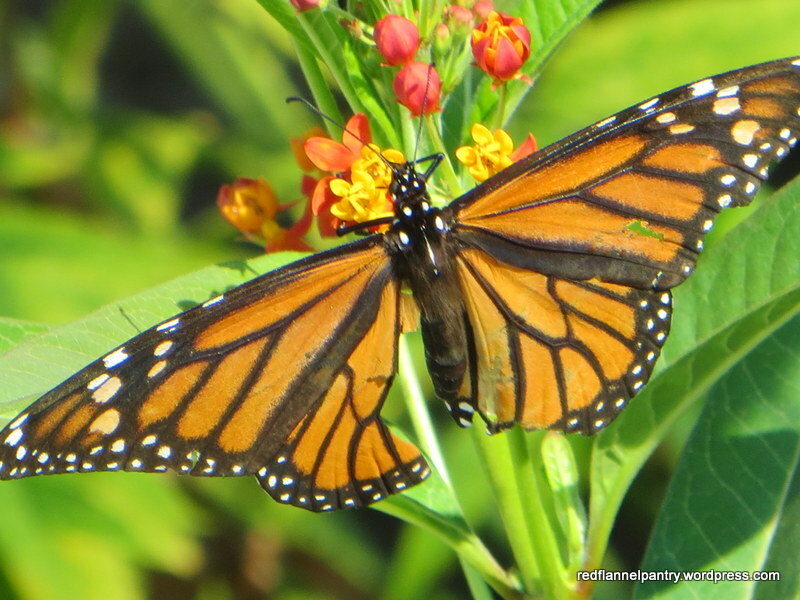 (MonarchWatch.org describes how to tell male vs. female.) Because there are no “swollen pouches” (ie, black dots) along the veins of the hindwings, I could tell that it was a female. Despite missing a significant part of one wing and having tears in the other, she was beautiful and had no trouble getting around–a wonder to watch. 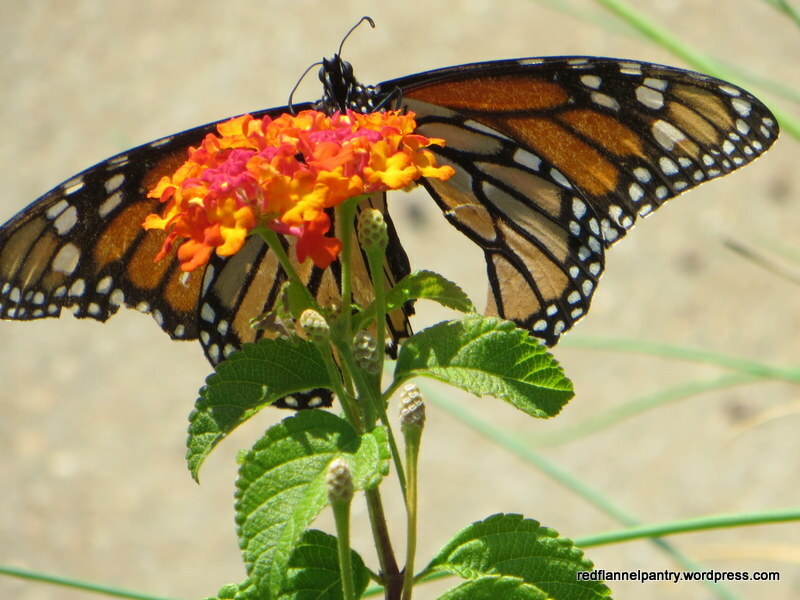 She was fond of the Dallas Red lantana and the blood flower (Asclepias curassavica). 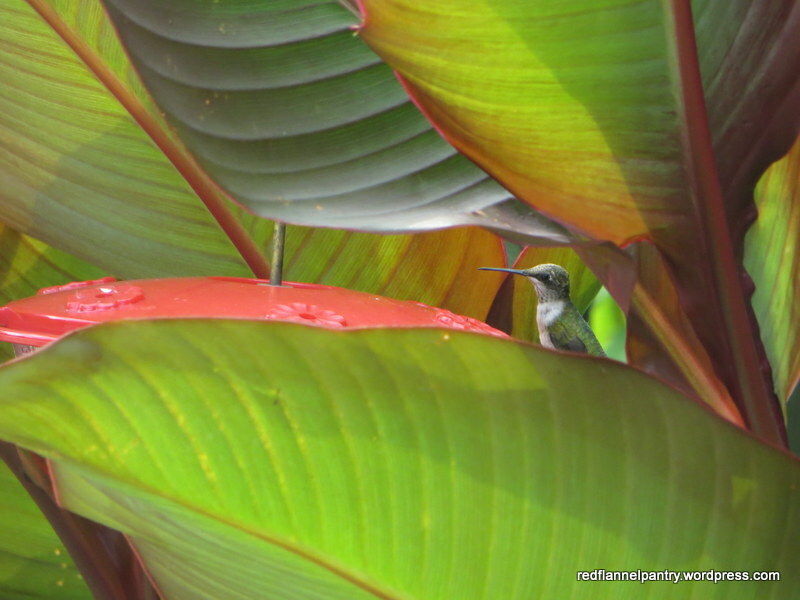 I spied this little hummer taking a well-deserved rest at the feeder among the canna lilies. Her moment of repose serves as a good reminder on a hot day. 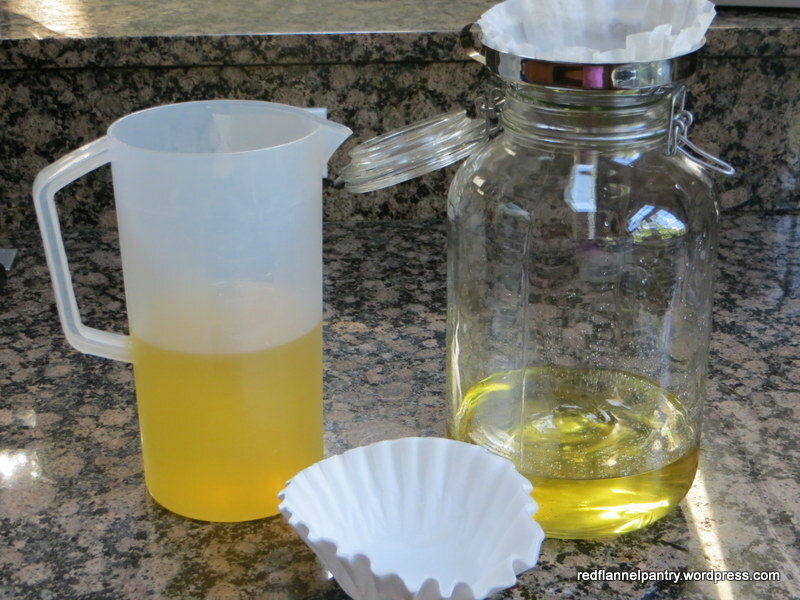 Simple syrup is brewing and lemon vodka is being strained. Limoncello tomorrow! This month the kids are peeling off, returning to college and high school. With the garden slowing down, I am back in the sewing room. First up, mending. My son is hard on his clothes, especially jeans. 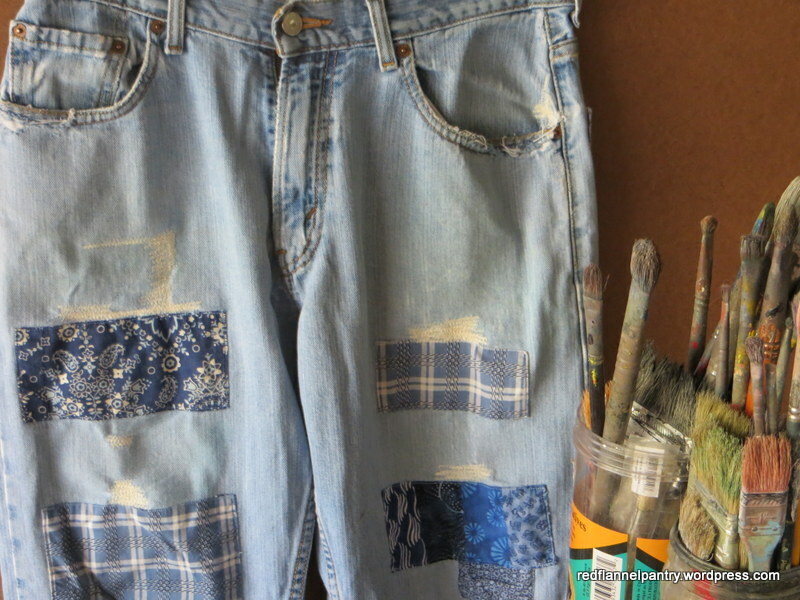 Since he’s an art student, having nice clothes doesn’t make much sense, so I mend the paint-spattered ones he brings home. This particular pair of jeans is several years old. The patches are from various things I’ve sewn: a quilt for him, a mini-quilt for a school auction, a table runner for a neighbor’s birthday, and the Union Jack quilt I recently finished. As I repair and stitch, it’s fun to revisit gifts I’ve made. He asked for no new patches, just fix the holes please. I ironed on pieces of heavy-duty interfacing on the inside and simply zig-zagged stitched like crazy on top. These jeans ought to last til Thanksgiving now. 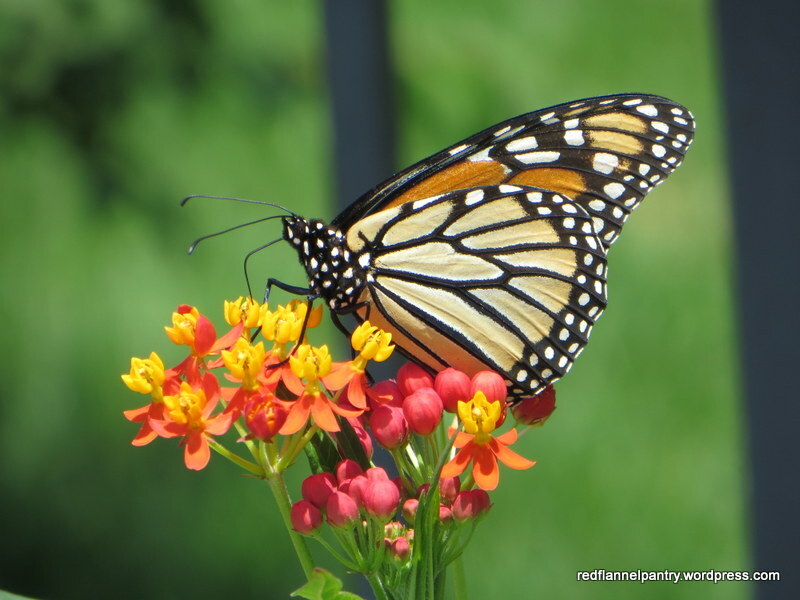 I just spotted this monarch butterfly in my garden–yay! It flit from bloodflower to milkweed to coneflower and back. I couldn’t tell if it was male or female (not easy to do! ), but I am hoping it was a female. 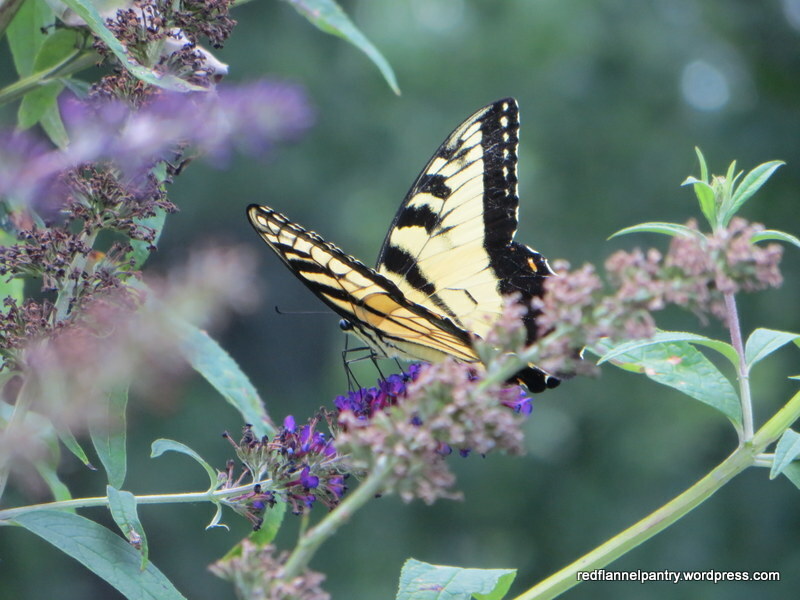 A tiger swallowtail butterfly visited the butterfly bush last week. I can count on my two hands the number of butterflies I’ve seen this summer–it’s discouraging. 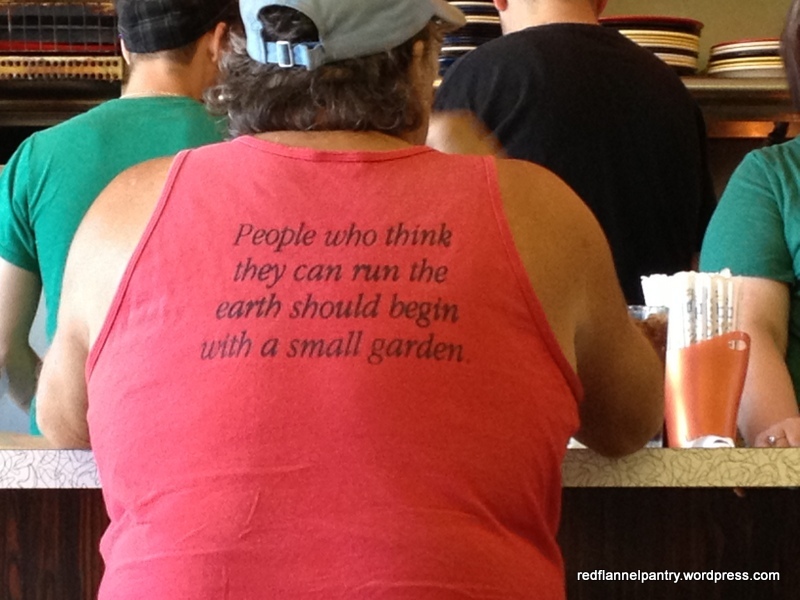 But I know there are plenty of other gardeners like me who are trying to provide food sources and safe havens. I hope what we are doing is enough to make a difference.